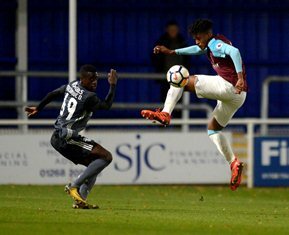 In a game involving three players of Nigerian descent at Chigwell Construction Stadium on Monday evening, three-time winners West Ham have crashed out of the FA Youth Cup following their 5-4 loss on penalties to Brighton & Hove. Left-footed central defender Ajibola Alese captained the Hammers team and was named in the starting line-up along with fellow defender Joshua Okocha and the highly-rated Seagulls right-back Ayo Tanimowo. Diallo opened the scoring for West Ham, before Cashman equalised after the break which sent the game into extra time. In the 104th minute, Brighton were awarded a penalty when Okocha fouled Cashman inside the area, only for Harry Jenks to miss the spot kick. With almost the last action of extra time, Alese found himself in an advanced position but opted to pass instead of shooting. The England U18 star was among the West Ham players successful from the spot in the shootout.